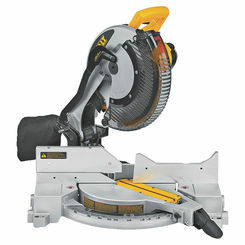 Dewalt DWS780 Double Bevel Sliding Compound Miter Saw, 120 V, 15 A. 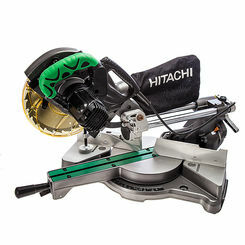 One of the most handy inventions for woodworkers, miter saws are a must have for most DIYers. 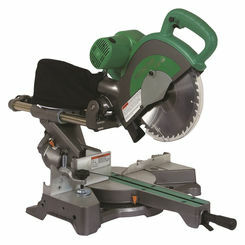 At PlumbersStock, you can save on all the best power tools and that includes the miter saw (also known as chop saws). 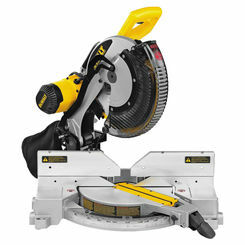 Buy one and cut wood at any angle you need or browse our other power saws. 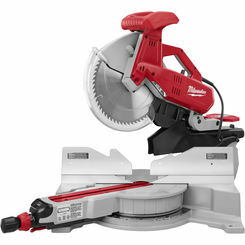 Get great deals on all your tools online, whether you need miter saw parts or any number of products from the most trusted manufacturers: Milwaukee, Ridgid, and Greenlee. 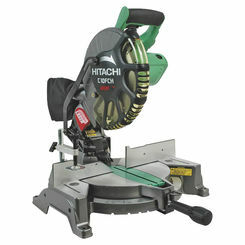 Miter saws are mechanically powered circular saws that offer accurate cuts on-the-go. 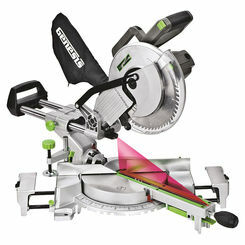 From miter and bevel cuts to compound cuts and crosscuts, miter saws are the perfect tools to tackle new home improvement projects head on. 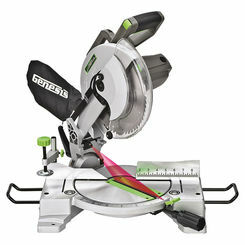 Operating with a blade mounted on a swing arm that pivots left or right, these saws produce angled cuts that be used for applications such as cutting crown molding, picture frames, door frames, and window casings. 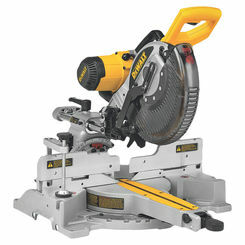 There are three types of miter saws: basic, compound (dual or single), and sliding compound. 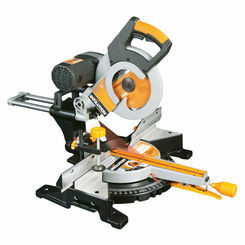 Basic Miter Saws – These kinds of saws are used for crosscuts and miter cuts. They have no bevel option but have the benefit of working easier, faster, and more accurately than using manual miter boxes and a handsaw. 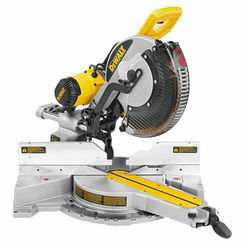 Combined with a low price tag and models that provide a more comfortable operation, this saw is a must-have for performing simple home improvement tasks. 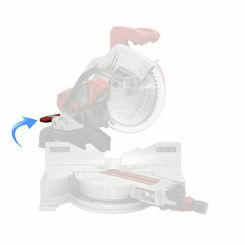 Compound Miter Saw – There are two options in this category, single compound and dual compound. 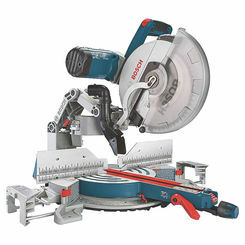 While both single and dual compound miter saws are used for cross-cuts, miter cuts, bevel cuts, and compound cuts (miter + bevel), only dual compound saws can tilt in two directions. This allows the user to quickly create bevels at any angle without having to flip your workpiece. 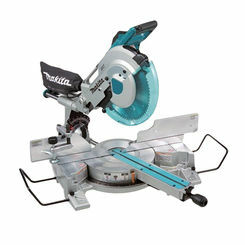 Sliding Compound Miter Saw – These saws create the same types of cuts as regular compound miter saws but offer greater versatility. 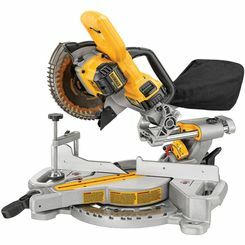 With help from the sliding head, this saw allows the user to cut through wider pieces by allowing you to move the blade forward and backward. This provides the increased length of cut that is necessary in so many projects. 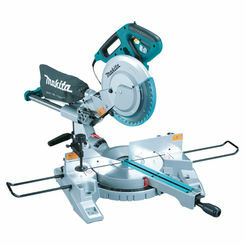 Miter saws come with many optional features to assist you in your project. 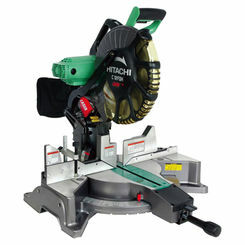 When shopping for the right miter saw, it’s important to keep these features in mind for enhanced efficiency and ease-of-use. 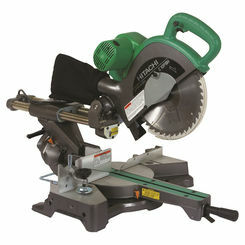 Wide Miter Range – Most miter saws offer maximum cuts that range from 50” to more than 60”. 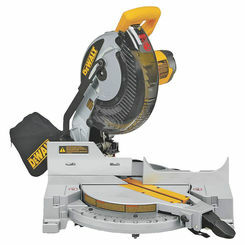 If your project requires long cuts, check the specifications and ensure your saw offers a wide enough miter range. Sliding Fence – A sliding fence provides full-height support for miter cuts and slides out of the way for bevel cuts. Adjustable Handle – Some models offer multiple handle positions that you can adjust to give your grip maximum comfort and control. Laser Guide – Some models feature laser guides that help you line your blade up with the intended cut line. Saws with a single laser show where the cut starts, while saws with dual lasers show the entire width of the cut. Dust Port – Dust ports let you connect a dust bag to your saw so you can collect sawdust as you work. This helps when you’re cleaning up your workspace after you’re done and allows you to maintain a clear environment. Electric Brake – A model with an electric brake heightens safety by stopping the blade automatically as soon as you release the trigger. 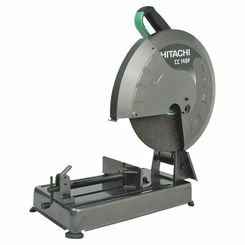 Easy-Change Blade – Some models offer one-step blade changes that enhance the user’s safety. If you plan on swapping out blades frequently, choosing a saw that makes the process easy and quick can decrease downtime to let you get back to work faster. 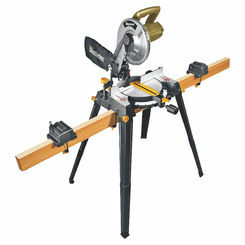 Stands – Stands can be purchased to give your miter saw better portability. If you cut long stock, some stands provide extensions to support longer work pieces. 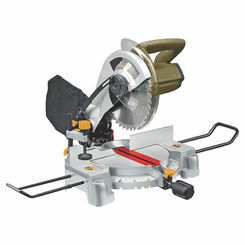 Save on the best saws available anywhere online, when you buy miter saws wholesale at PlumbersStock.  If you have any trouble locating the right tool, please contact our customer service team.